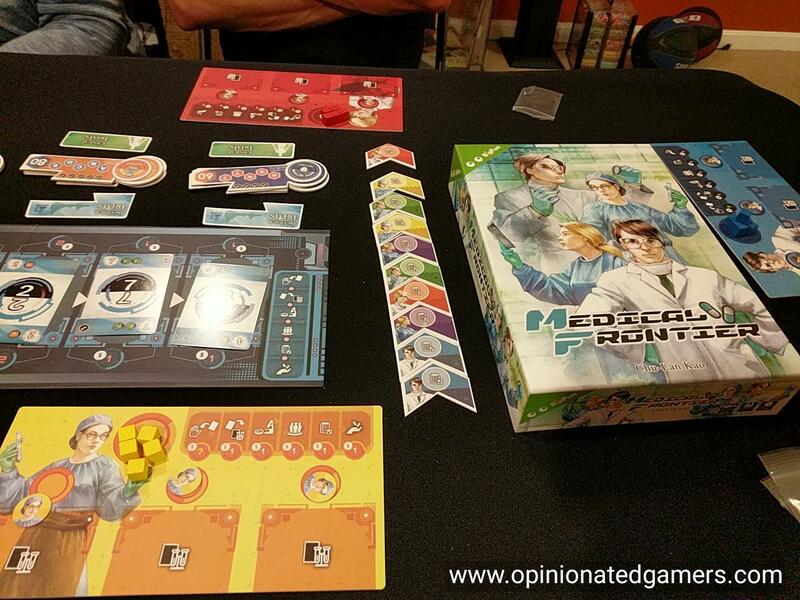 I have always been interested in games with a medical theme (because who doesn’t love to mix their profession with their hobby…), and when I first read about Medical Frontier, I was immediately attracted to it. 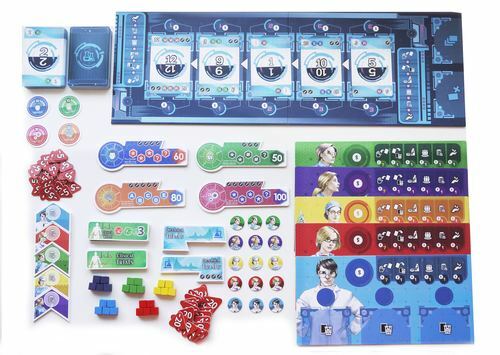 This game approaches the medical field from a direction that I haven’t seen before – a game set in the world of development and marketing of new pharmaceuticals. It may not be the most glamorous side of medicine – but it’s one that needs to happen in order for us to keep fighting diseases. The game appears to be sponsored or backed by Bayer, one of the major worldwide pharmaceutical companies. Their logo in in the rules, and the last page points players to the Bayer website to learn more about the process. 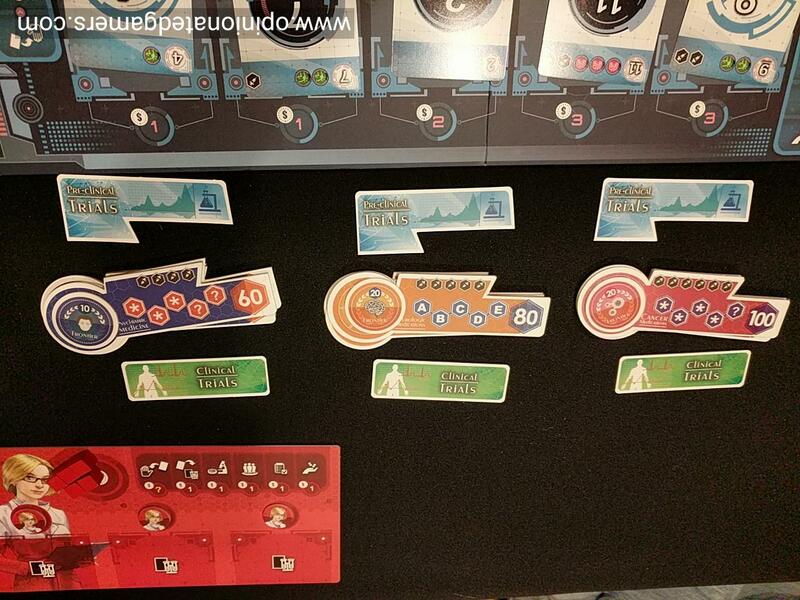 In the game, each player gets their own lab board with 3 different lab areas on it. The background color shows your player color. There are a number of round tiles in each player color, they are pulled out and shuffled and then arranged on the table in a random fashion – this will determine the start player for each round. There is a deck of compound cards – essentially numbered cards – which are shuffled as a draw deck. Five are placed face up on the central board as a supply. The drug tiles are sorted by type and placed on the table as a supply as well. Each type gets a randomly chosen Pre-clinical trial tile and a Clinical Trials tile placed next to it. The game is played in a number of rounds where players develop their drugs. The process has six phases – which is also nicely summarized at the top of the player board as well as on the edge of the main board. On each turn, you can decide how you want to allocate your 5 budget cubes amongst the different steps. So, on a turn, you have five action cubes to use. The cost of each phase is one cube except for the first which can be variable. You can repeat most steps as many times as you like – so long as you have the cubes to pay for them. You are not required to use all your cubes, but you will not carry any over into the next round. Once you are done using all of your action cubes, play passes to the next player clockwise. This continues until all players have had a turn. Then, the next round starts with whichever player is on top of the turn order column. For the cost of one cube, play a card from your hand into any of the three lab areas on your board. There is a limit of 5 cards to an area. Your goal here is to match the pattern as set out on the Drug tiles. When you play a card, you can replace a previously played card with the one you are playing now; but you MAY NOT move a previously played card to a different part of your lab. 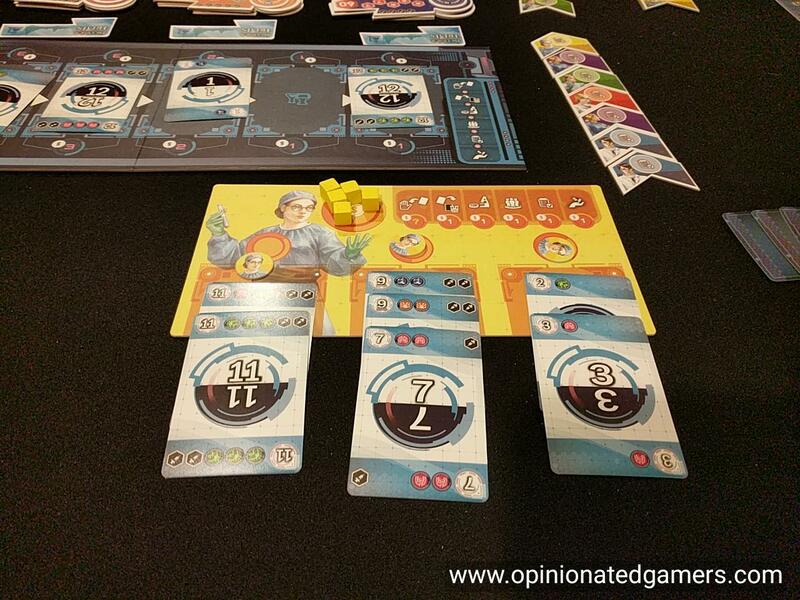 Pay a cube and then flip over the researcher token in one of your lab areas that has five cards. The pattern here has to match one of the available drug tiles. Use the Pre-clinical trial piece for this type of drug (if you are the first, you have to flip it over to reveal it) – then count the number of syringes seen between the two to calculate the minimum efficiency. Then compare this to the number of syringes seen on the five cards comprising your new drug. For each lacking syringe, you will take a -5 penalty token on your cards. Pay a cube and then compare the side effects of your cards to that of the clinical trials tile for your type of drug. If you are the first in a particular class, you must flip over the tile to see what the side effect limits are. If you do not exceed the limits, you are good to go. Place your researcher tile for this drug onto the current round marker. If you have excess side effects, you must then place your researcher tile one space lower on the track for EACH excess side effect. You will be able to launch the drug once your researcher marker is on the top of the turn order track. This is the only action which is limited to once per turn. You can pay a cube to accelerate the launch of your new drug. When you pay your cube, you may move up your research token by one space on the turn order track. Pay a cube to release your drug into the market – you may only do this is your researcher token is on the topmost space of the turn order track. Take the Drug tile that corresponds to your cards – you will score the VPs printed on the tile (minus any penalties you had accured earlier). If you are the first to release a drug of a particular type, you will also get the Medical Frontier tile for that class (with its bonus VP). Discard the compound cards and place your researcher token back on your board. Game End – the game ends at the end of any round if a player reaches 300 points. Alternatively, the game can also end when the final drug compound has been launched. The player with the most points wins. 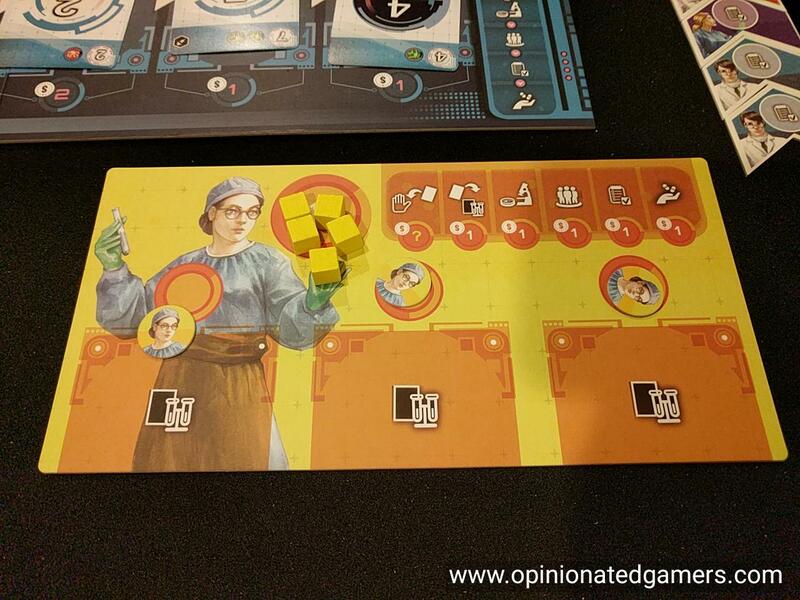 Given my IRL job as a physician, I was immediately interested in the idea of a pharmaceutical themed game. Medical Frontier gives the gamer an interesting insight into how new drugs are made. Sure, I’m certain that plenty of things have been simplified or game-ified, but the game runs you through all the different steps necessary to create and sell a new compound. I’m guessing that this is a fairly realistic approach given that the game also appears to be sponsored by Bayer, one of the large German pharmaceutical companies. The set collection phase of the game with the numbered cards is interesting. While your hand cards are hidden, your three lab benches are open, so once you start playing cards to the table, everyone can see what you’re working on. Sure, it’s possible to somewhat hide your intentions by playing cards cleverly, but your hand limit of only 5 cards often forces you to play something to the table as you work on your different sets. Sure, you could try to collect cards for just one compound at a time, but this seems like an inefficient way to go about things. The fixed efficacy and side effect profiles seen per class in the Pre-clinical trials and Clinical trials don’t make any sense in the actual IRL process of making drugs, but for the purposes of the game, it works just fine. There is obviously a slight disadvantage to starting a class first because you don’t know what the requirements will be beforehand – however, getting the first shot at the bonus points for the Medical Frontier token seem to balance this out. Heck, depending on what cards other people have played or collected, it might be too late for them to change their strategic path anyways, even though they are not first to try to make a drug in a class. The limit of 5 action cubes per turn often gives the player some interesting decisions when trying to decide what to do on a turn. If you want a newly revealed card, it could cost you up to three cubes for that single card. This, of course, means that you have fewer cubes to used in other actions later in your turn. At the start of the game, you’re mostly acquiring and playing cards, but once you start working on your first drug, you’ll have to be choosing between gaining/playing cards and trying to advance the progress of your drugs in the pipeline. 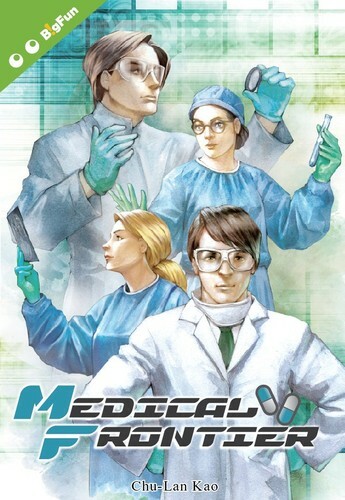 There honestly haven’t been many good strategic games with a medical theme that have actually been fun as a game, and this one definitely gets a spot in my collection as it’s the best one that I have in this admittedly limited genre. I think that the true test of the game would be the question: would I still be interested in the game if it didn’t have a theme which really appealed to me? And for Medical Frontier, I think that answer would be a yes. An interesting game and theme, I will be trying it out. My friends who work for a large drug company would tell you the main (expensive) missing component: engineering the manufacturing process. Not important for the game experience, I’m sure.